Published ahead of print in the Journal of the American Society of Nephrology, a new study pushes the boundaries of regenerative medicine. Italian researchers led by Christodoulos Xinaris derived renal organoids from embryonic stem cells. 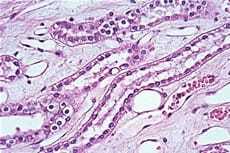 These kidney-like cells, when injected into rats, matured into vascularized, physiologically active kidney tissue. As a next step, these scientists are working to generate a human kidney from stem cells.